To improve the quality of education by modernizing 50 to 60 year-old classrooms, restrooms, and school facilities; replace leaky roofs CriticalIs it a coincidence that every district in the state has "leaky roofs"? You might even ask if leaky roofs actually exist? If they do, why haven't they been repaired yet. Are they reported on the School Accountability Report Card? If not, then you're being lied to. According to the school bond cartel's professional marketing study, claiming "leaky roofs" translates directly into yes votes from voters who are made to feel guilty about it. ; make health and safety improvements including major mold removal, lead and asbestos CriticalUltimate guilt! Are your children going to school in death traps? Has the district identified any facility in the whole district that has a specific, known asbestos problem? Of course not! It's just a ploy to get you to vote yes. abatement; increase student access to computers/ technology/ to meet 21st century educational standards; and replace deteriorating plumbing, sewer, electrical heating, and cooling systems. Mountain Valley Unified School District will issue $5,950,000 of bonds at legal interest rates, have an independent citizens' oversight committee CriticalIndependent? Really? The staff selects the committee. The Board rubber-stamps it. The Board can remove anyone who questions anything that the money is used for. You can be certain that there won't be anyone on the committee who isn't a cheerleader for spending your money on architectural marvels, like the Taj Mahal. and have NO money for administrative or teachers salaries. Everyone knows the importance and value of having quality schools. From higher achieving students, to greater neighborhood safety, to increased home values, quality schools make a difference. Our schools are outdated and upgrades and renovations need to be made. While facilities have been well maintained over the years, the average age of our facilities is over 55 years old with our oldest operational school, Hayfork Elementary, first built in 1955. Our schools must be upgraded since many do not meet 21st century education and technology standards. In addition, significant mold problems keep our students and teachers from using classrooms and facilities. If approved, Measure J would abate serious mold issues and bring our schools up to 21st century standards. By investing in our schools, we can meet today's safety, technological, and educational standards and improve our community. a By law, spending must be reviewed and annually audited by an independent citizens' oversight committee. o All Measure J funds MUST be spent locally to improve our children's schools and CANNOT BE TAKEN AWAY BY THE STATE! Our local schools are our most important assets and should be our number one priority. Measure J makes health and safety improvements, renovates old and outdated classrooms, improves the education of local children, and maintains the quality of our community. That's something we can all support. Please join us and vote Yes on Measure J! This proposition may be known and referred to as the Mountain Valley Unified School District General Obligation Bond of 2017, or Measure J. By approval of this proposition by at least 55% of the registered voters voting on the proposition, the Mountain Valley Unified School District (District) shall be authorized to issue and sell bonds of up to $5,950,000 in aggregate principal amount to provide financing for the specific school facilities projects listed in the Bond Project List below, and in order to qualify to receive State matching grant funds, subject to all of the accountability safeguards specified below. Evaluation of Needs. The Board of Trustees hereby certifies that it has evaluated safety, class size reduction, and information technology needs in developing the Bond Project List. Limitation on Use of Bond Proceeds. The State of California does not have the power to take locally approved school district bond funds for any State purposes. The Constitution allows proceeds from the sale of bonds authorized by this proposition to be used only for the construction, reconstruction, rehabilitation, or replacement of school facilities listed in this proposition, including the furnishing and equipping of school facilities, or the acquisition or lease of real property for school facilities, and not for any other purpose, including teacher and administrator salaries and other school operating expenses. Proceeds of the bonds may be used to pay or reimburse the District for the cost of District staff CriticalWhat was that they said about no administrative salaries? only when performing work on necessary and incidentals to the bond projects. Independent Citizens' Oversight Committee. The Board of Trustees shall establish an independent Citizen's Oversight Committee (pursuant to Education Code Section 15278 and following), to ensure bond proceeds are spent only for the school facilities projects listed in the Bond Project List. The committee shall be established within 60 days of the date on which the Board of Trustees enters the election results on its minutes. Annual Financial Audits. The Board of Trustees shall conduct an annual independent financial audit of the bond proceeds (which shall be separate from the District's regular annual financial audit) until all of those proceeds have been spent for the school facilities projects listed in the Bond Project List. Special Bond Proceeds Account; Annual Report to Board. Upon approval of this proposition and the sale of any bonds approved, the Board of Trustees shall take actions necessary pursuant to Government Code Section 53410 and following to establish an account in which proceeds of the sale of bonds will be deposited. As long as any proceeds of the bonds remain unexpended, the Superintendent or Chief Business Official of the District (or such other employee as may perform substantially similar duties) shall cause a report to be filed with the Board no later than December 31 of each year, commencing December 31 of the year in which bonds are first issued, stating (1) the amount of bond proceeds received and expended in that year, and (2) the status of any project funded or to be funded from bond proceeds. The report may relate to the calendar year, fiscal year, or other appropriate annual period as such officer shall determine, and may be incorporated into the annual budget, audit, or other appropriate routine report to the Board. Specific Purposes. All of the purposes enumerated in this proposition shall be united and voted upon as one single proposition, pursuant to Education Code Section 15100, and shall constitute the specific purposes of the bonds, and proceeds of the bonds shall be spent only for such purpose, pursuant to Government Code Section 53410. Joint Use. The District may enter into agreements with the County of Trinity or other public agencies or nonprofit organizations for joint use of school facilities financed with the proceeds of the bonds in accordance with Education Code Section 17077.42 (or any successor provision). The District may seek State grant funds for eligible joint-use projects as permitted by law, and this proposition hereby specifies and acknowledges that bond funds will or may be used to fund all or a portion of the local share for any eligible joint-use projects identified in the Bond Project List or as otherwise permitted by California State regulations, as the Board of Trustees shall determine. The Bond Project List below describes the specific projects CriticalThis really takes the cake. How is any of this "a list of the specific school facilities projects to be funded" as required by the California Constitution? It's not. It authorizes the district to spend the money on whatever it wants, whenever it wants, wherever it wants. the Mountain Valley Unified School District proposes to finance with proceeds of the bond. Listed projects will be completed as needed at a particular school site according to Board-established priorities, and the order in which such projects appear on the Bond Project List is not an indication of priority for funding or completion. The final cost of each project will be determined as plans are finalized, construction bids are awarded, and projects are completed. Certain construction funds expected from non-bond sources, including State grant funds for eligible projects, have not yet been secured. Until all project costs and funding sources are known, the Board of Trustees cannot determine the amount of bond proceeds available to be spent on each project, nor guarantee that the bonds will provide sufficient funds to allow completion of all listed projects. Completion of some projects may be subject to further government approvals or appropriation by State officials and boards, to local environmental review, and to input from the public. For these reasons, inclusion of a project on the Bond Project List is not a guarantee that the project will be funded or completed. The Board of Trustees may make changes to the Bond Project List in the future consistent with the projects specified in the proposition.
? Federal and State-mandated Americans with Disabilities Act (ADA) accessibility upgrades including site access, parking, staff and student restrooms, relocation of some existing electrical devices, drinking fountains, playground equipment, etc.
? Pay or prepay interim funding, including lease obligations and certificates of participation, which was used to advance fund the projects listed above CriticalLeases are OPERATING expenses explicitly prohibited by the Constitution Article XIII-A Section 1(b)(3)(A) (Proposition 39). "not for any other purpose, including teacher and administrator salaries and other school operating expenses." . The list projects will be completed as needed CriticalYou see? None of these repairs are current needs. They may be needed in the future, though. After years and years of neglect, any facility will fall into disrepair. . Each project CriticalHere it comes. This is the kitchen sink paragraph. Ask an English teacher to diagram every sentence. See if any two people can agree on what all this gibberish means. It's here so that just in case the district left something out, this covers it, no matter what the district wants to do. is assumed to include its share of furniture, equipment, architectural, engineering, and similar planning costs, program/project management, staff training expenses CriticalTraining is an operating expense, specifically prohibited by the California Constitution. What will it train staff to do? How to open a door? How to turn on the lights? This is just another way to move operating costs from the general fund to the bonds and use the money saved to pay salaries, benefits, and pensions. , and a customary contingency for unforeseen design and construction costs. In addition to the listed projects stated above, the Bond Project List also includes the acquisition of a variety of instructional, maintenance and operational equipment, including the interim funding incurred to advance fund projects from the Bond Project List and the payment and/or repayment of outstanding lease obligations CriticalLeases are OPERATING expenses explicitly prohibited by the Constitution Article XIII-A Section 1(b)(3)(A) (Proposition 39). "not for any other purpose, including teacher and administrator salaries and other school operating expenses." ; installation of signage and fencing; payment of the costs of preparation of all facility planning, facility studies, assessment reviews, facility master plan preparation and updates CriticalFacilities master plans are required by law, whether or not there is a bond. These are OPERATING expenses explicitly prohibited by the Constitution Article XIII-A Section 1(b)(3)(A) (Proposition 39). "not for any other purpose, including teacher and administrator salaries and other school operating expenses." , environmental studies (including environmental investigation, remediation and monitoring), design and construction documentation, and temporary housing of dislocated District activities caused by construction projects. In addition to the items listed above, the repair and renovation of each of the existing school facilities may include, but not be limited to, some or all of the following: renovation of student and staff restrooms; repair and replacement of heating and ventilation systems; upgrade of facilities for energy efficiencies; repair and replacement of worn-out and leaky roofs, windows, walls, doors and drinking fountains; installation wiring and electrical systems to safely accommodate computers, technology and other electrical devices and needs; upgrades or construction of support facilities, including administrative and physical education buildings and properties; repair and replacement of fire alarms, emergency communications and security systems; resurfacing or replacing of hard courts, turf and irrigation systems and campus landscaping and play fields; expand parking; install interior and exterior painting and floor coverings; demolition; and construction of various forms of storage and support spaces; upgrade classrooms, bleachers, kitchens; repair, upgrade and install interior and exterior lighting systems; replace outdated security fences and security systems. The upgrading of technology infrastructure includes, but is not limited to, computers, LCD projectors, portable interface devices, servers, switches, routers, modules, sound projection systems, laser printers, digital white boards, document projectors, voice-over IP, call manager and network security/firewall, wireless technology systems and other miscellaneous equipment and software. The allocation of bond proceeds will be affected by the District's receipt of State matching funds and the final costs of each project. The budget for each project is an estimate and may be affected by factors beyond the District's control. Some projects throughout the District may be undertaken as joint use projects CriticalThe California Constitution prohibits the use of Proposition 39 bond funds for anything other than "school facilities." The term is used no less than five times in the Constitution. It's not for funding community projects. in cooperation with other local public or non-profit agencies. The final cost of each project will be determined as plans and construction documents are finalized, construction bids are received, construction contracts are awarded and projects are completed. Based on the final costs of each project, certain of the projects described above may be delayed or may not be completed. Demolition of existing facilities and reconstruction of facilities scheduled for repair and upgrade may occur, if the Board determines that such an approach would be more cost-effective in creating more enhanced and operationally efficient campuses. Necessary site preparation/restoration may occur with new construction, renovation or remodeling, or installation or removable of relocatable classrooms, including ingress and egress, removing, replacing, or installing irrigation, utility lines, trees and landscaping, relocating fire access roads, and acquiring any necessary easements, licenses, or rights of way to the property. Proceeds of the bonds may be used to pay or reimburse the District for the Cost of District staff CriticalWhat was that they said about no administrative salaries? when performing work on or necessary and incidental CriticalWho do you think gets to decide? to bond projects and to pay costs of issuing the bonds. An election will be held in the Mountain Valley Unified School District (the "District") on November 7, 2017 to authorize the sale of up to $5,950,000 in general obligation bonds. The following information is submitted in compliance with Sections 9400-9404 of the California Elections Code. 1. The best estimate of the tax rate that would be required to fund this bond issue during the first fiscal year after the sale of the first series of bonds, based on estimated assessed valuations available at the time of filing of this statement, is $0.06 per $100 ($60 per $100,000) of assessed valuation in fiscal year 2018-19. 2. The best estimate of the tax rate that would be required to fund this bond issue during the first fiscal year after the sale of the last series of bonds, based on estimated assessed valuations available at the time of filing of this statement, is $0.06 per $100 ($60 per $100,000) of assessed valuation in fiscal year 2022-23. 3. The best estimate of the highest tax rate that would be required to fund this bond issue, based on estimated assessed valuations available at the time of filing this statement, is $0.06 per $100 ($60 per $100,000) of assessed valuation in fiscal year 2018-19. 4. The best estimate from official sources of the total debt service, including the principal and interest, that would be required to be repaid if all the bonds are issued and sold will be approximately $11,868,786. SECTION 1. Call for Election. The Board hereby orders an election and submits to the electors of the District the question of whether general obligation bonds of the District shall be issued and sold in the maximum principal amount of $5,950,000 for the purpose of raising money to finance school facilities and property of the District, and paying costs incident thereto, as set forth more fully in the ballot proposition approved pursuant to Section 3. This Resolution constitutes the order of the District to call such an election. SECTION 3. Purpose of Election; Ballot Proposition. The purpose of the election shall be for the voters in the District to vote on a proposition, a full copy of which is attached hereto and marked Exhibit A, containing the question of whether the District shall issue the Bonds for the purpose state therein, together with the accountability requirements of Article XIII A and Government Code Section 53410 and the requirements of Section 15272 of the Act. The Trinity County Registrar of Voters (County Registrar) is requested to print the Full Text of Measure contained on Exhibit A hereto in the sample ballot pamphlet. As required by Elections Code Section 13247, the abbreviated form of the measure to appear on the ballot is attached hereto and marked as Exhibit B. The Superintendent or his designee is hereby authorized and directed to make any changes to the text of the proposition or this resolution as required to conform to any requirements of Article XIII A, the Act, or the County Registrars. SECTION 4. Authority for Election. The authority for ordering the election is contained in Section 15264 et. seq. of the Education Code and Section I, paragraph (b), subsection (3), of Article XIII A. The authority for the specification of this election order is contained in Section 5322 of the Education Code. SECTION 5. School Facilities Project. As required by Article XIII A, the board hereby certifies that is has evaluated safety, class size reduction, enrollment growth, and information technology needs in developing the list of school facilities projects set forth on Exhibit A. SECTION 6. Covenants of the Board upon Approval of the Bonds by the Electorate. 6. cause the preparation of an annual report to Government Code Sections 53410 and 53411. The Clerk of the Board is hereby directed to send a copy of this Resolution to the Trinity County Superintendent of Schools, the County Registrar, and the Trinity County Clerk of the Board of Supervisors. SECTION 8. Consolidation of election. The County Registrar and the Trinity County Board of Supervisors are hereby requested to consolidate the election ordered hereby with any and all other elections to be held on November 7, 2017, within the District. Any and all members of this Board are hereby authorized to act as an author of any ballot argument prepared in connection with the election, including a rebuttal argument. The Superintendent, President of the Board, or their designees, are hereby authorized to execute any Tax Rate Statement or other document and to perform all acts necessary to place the bond measure on the ballot. Pursuant to Sections 5303 of the Education Code and Section 10002 of the Elections Code, the Board of Supervisors of Trinity County are requested to permit the County Registrar to render all services specified by Section 10418 of the Elections Code relating to the election, for which services the District agrees to reimburse the County in full upon presentation of a bill, such services to include the mailing of the sample ballot and tax rate statement (described in Section 9401 of the Elections Code). This resolution shall take effect on and after its adoption. PASSED AND ADOPTED by the Board of Trustees of the Mountain Valley Unified School District the 14th day of June, 2017. Arguments For or Arguments Against the measure shall be submitted no later than 4:00 p.m. on Thursday, August 10, 2017 to the Trinity County Election's Office, 11 Court Street, Weaverville, CA 96093. Arguments For and Arguments Against this measure are limited to 300 words or less and must be accompanied with a signed statement that the argument is true and correct, which is available on the Trinity County Election's Website or Trinity County Election's Office. Rebuttals to Arguments For or Arguments Against the measure are limited to 250 words and shall be submitted no later than 4:00 p.m. on Friday, August 18, 2017 to the County Election's Office. Contact the County Election's Office at (530) 623-1220 for further information. The public examination period is Saturday, August 19, 2017 through Monday, August 28, 2017. NOTICE IS FURTHER GIVEN that the poll at said election will be open from 7:00 a.m. until 8:00 p.m. 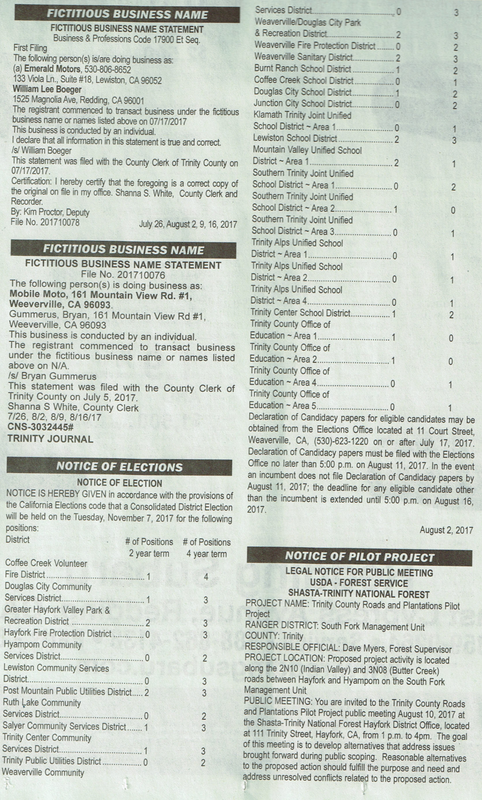 The following is a transcription of the notice of election published in the Trinity Journal on August 2, 2017. If you can make sense out of it, you're better than most. Pay particularly close attention to rows designated with as '~ Area n,' which can only reasonably be interpreted as short-hand for Trustee Area. You are directed to the row highlighted in green for the Mountain Valley Unified School District. For school and college districts, only the Superintendent of the County Office of Education can call elections for "directors" (trustees). 3 CriticalInteresting. A Trustee Area with three seats up for election. Where is the election order that supports this? Or did Shanna White, the corrupt Registrar of Voters, just screw up? Again? Mountain Valley Unified School District ~ Area 1 CriticalSo, is Mountain Valley Unified divided into trustee areas? Compare Southern Trinity Joint Unified below. 2 CriticalA two-year term is one where a vacancy occurred in a four-year term seat. Perhaps the vacancy was temporarily filled by appointment. This kind of seat must be elected at the next regularly scheduled election for officers of that type. 1 CriticalHmm. Only one four-year term. On a 5-member governing board, the seats are staggered with two or three up for election every two years. How does this happen? Another screw-up? By whom? Declaration of Candidacy papers for eligible candidates may be obtained from the Elections Office located at 11 Court Street, Weaverville, CA, (530)-623-1220 on or after July 17, 2017. Declaration of Candidacy papers must be filed with the Elections Office no later than 5:00 p.m. on August 11, 2017. In the event an incumbent does not file Declaration of Candidacy papers by August 11, 2017; the deadline for any eligible candidate other than the incumbent is extended until 5:00 p.m. on August 16, 2017.